Ancient Egyptians during the third and fourth dynasties perfected the construction of pyramids as burial chambers for their kings. 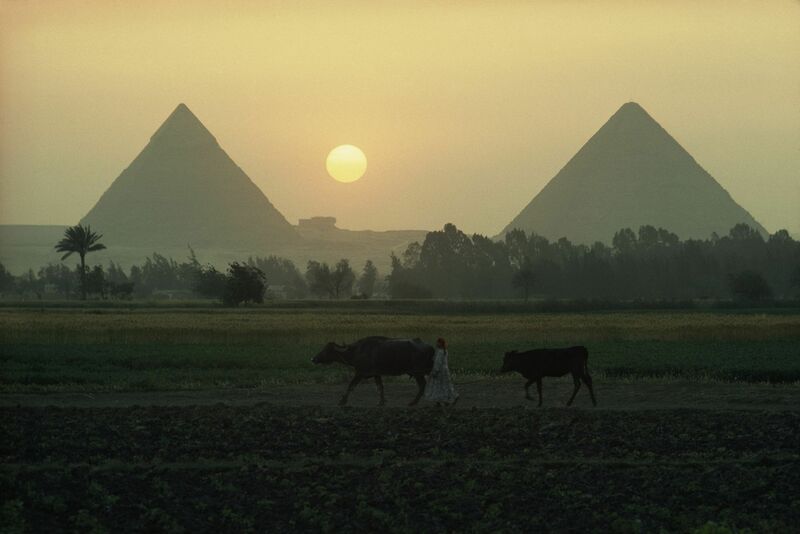 The Great Pyramids of Giza have been a part of the Egyptian landscape for thousands of years. Here, they appear almost like mountains in the background as a woman leads cows across a field. Archaeologist Zahi Hawass has been studying and preserving the Egyptian pyramids for decades. The area around the ancient capital city of Memphis, Egypt, located just south of modern-day Cairo along the Nile River, contains dozens of pyramids built as burial chambers for kings during the third and fourth dynasties. In 2017, Dr. Hawass was appointed to oversee the restoration of the oldest of these pyramids—a stone step pyramid near Saqarrah, built by architect Imhotep for King Djoser around 2780 B.C.E. This step pyramid is significant because it was the first stone building constructed by the Egyptians. It also marked a departure from the traditional burial structure known as a mastaba. A mastaba was a rectangular burial mound with sloping walls and a flat roof. Mastabas were usually built using mud bricks, but occasionally they were stone. The step pyramid was constructed of six mastabas stacked together. The largest formed the base, and the rest decreased in size so that the smallest was at the top of the structure. A later king, Snefru, made further advancements in pyramid building. His first pyramid began as a step pyramid, but he later filled in the steps to create a more pyramid-like shape. Snefru then attempted to build a pyramid near Saqqarah. This pyramid had a square base and four triangular walls that sloped inward to meet at a central point. Partway through construction, builders had to change the slope of the structure so the angle was less acute. Today, this pyramid at Saqqarah is known as the Bent Pyramid because of its slightly curved appearance. Snefru's final pyramid attempt, called the Red Pyramid and located near Dahshur, is believed to be the first to have been designed as a pyramid from the beginning. Snefru's son, grandson, and great-grandson would build on Snefru's ideas and create the three famous pyramids near Giza. His son Khufu built what is today known as the Great Pyramid. Originally 146 or 147 meters (479 or 482 feet) high, the Great Pyramid required 300,000 blocks and more than two million tons of stone. Dr. Hawass helps put the Great Pyramid's immense size into perspective. He says that the blocks "could be used to build a three-meter-high (9.8 feet) wall around France. If we cut them into small pieces, they could cover two-thirds of the globe." Khafre, Khufu’s son, built a somewhat smaller pyramid nearby, and Khafre's son Menkure built yet another smaller pyramid. The four sides of all three of these pyramids have perfect north, south, east, and west orientations. How the ancient Egyptians accomplished this without a compass remains a mystery, as does how the pyramid builders built such massive structures without modern tools or conveniences. Archaeologists continue to make new discoveries about the pyramids, such as Dr. Hawass’s discovery of the tombs of the pyramid builders just outside the Great Pyramid. Hawass believes new technology "could be very useful in revealing the remaining secrets of the pyramids." civilization in northeastern Africa, lasting from 3200 BCE to about 400 CE. person who designs buildings or other large structures. instrument used to tell direction. three-dimensional shape with a square base and triangular sides that meet in a point.